"One genius criminal profiler. One ruthless, streetwise cop. Both will need all their wits to capture the most notorious killer of all time. "New York, 1891. A prostitute is found brutally murdered. The victim bears the same hallmarks as a notorious recent killing spree in England. Could it be that killer has crossed the Atlantic to fresh killing grounds? Or is this simply a copycat murder? Fear spreads through a city already rife with cut-throat gangs, corruption and vice. Aristocratic English pathologist, Finley Jameson, is teamed up with Joseph Argenti, a streetwise New York cop, to solve the case. 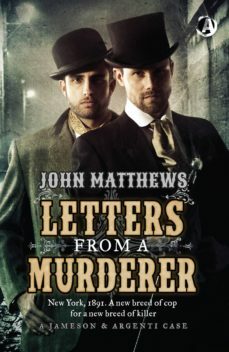 But as the body-count rises and the killer taunts his pursuers in open letters, Jameson&Argenti find themselves fighting not just to prevent yet more victims, but also to save the citys very soul.